Installing anti-fatigue matting can increase productivity and reduce costs in the workplace, in addition to creating a safer environment to reduce the risk of accidents and injuries at work. Placing anti-fatigue mats in areas where workers are required to stand for long periods allows them to perform their duties in greater comfort and work with greater concentration and more efficiency. How Does Anti-Fatigue Matting Work? Concrete and cement flooring is used throughout industry because it is hard-wearing and non-porous; however hard surfaces can take their toll on the health of employees. These floor surfaces offer no shock absorption or cushioning and standing for long periods can lead to a number of health complaints developing, even when high quality footwear is worn. 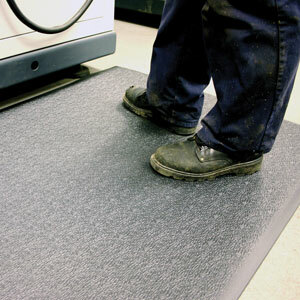 Anti-fatigue matting has elasticity and absorbs shockwaves from walking, while easing pressure points when standing. The rubber flooring causes small, regular movements in the legs and feet which help to improve blood circulation and thus can reduce fatigue and tiredness. A recent Loughborough University study has confirmed the health benefits of anti-fatigue matting in the workplace. Participants were required to stand for 90-minute periods on a concrete floor for a period of 5 days, while researchers measured signs of discomfort, fatigue and tiredness. The study confirmed that prolonged standing leads to serious discomfort in the feet, legs and back. Some participants also complained of stiffness in the neck and shoulders. Installing anti-fatigue matting around workstations - or the entire work premises - can help to reduce worker fatigue and the host of musculoskeletal problems which this can cause over time. Employees can be protected from injury while employers can lower the risk of future worker compensation claims. Falls and slips & trips were responsible for more than half of all major injuries to employees reported to the Health and Safety Executive in 2011/12. Slips, trips and falls accounted for almost a third of 3-day+ absences from work due to injuries in the workplace. Many of these slips and falls could have been prevented had appropriate health and safety features been installed in the workplace, such as non slip anti-fatigue matting. Anti-fatigue matting is constructed from non-slip rubber which helps to prevent slips and falls, especially in wet or oils areas. Drainable anti-fatigue mats ensure spillages quickly dissipate to keep the floor surface safe, while the rubber provides cushioning to reduce breakages. Cold concrete factory floors can be a source of discomfort for workers in winter and can lead to a loss of productivity. Anti-fatigue matting is an effective insulator which can improve comfort in cold conditions, while the insulation can help to reduce heating costs in the workplace. The discomfort caused by standing on concrete floors decreases productivity of the workforce as aches and pains develop. Minor aches and pains can lead to more serious conditions developing, ultimately resulting in absenteeism from work. With anti-fatigue matting installed, employees can work in greater comfort with improved concentration and efficiency. Improving employee comfort also improves morale and lead to a greater enthusiasm for work. ESE Direct stocks a wide choice of anti fatigue floor mats at a range of thicknesses for all business and industrial uses, including drainable anti-fatigue mats for wet or oily areas, fire retardant anti-fatigue mats and ESD static dissipative earthed mats. Pre-cut anti-fatigue mats can be purchased for use next to workstations or matting can be purchased by the linear metre.